Ahead of the 2019 general election, a factional group has broken out of the All Progressive Grand Alliance, calling itself, the Authentic All Progressives Grand Alliance. According to a report by Vanguard, the fall out of primaries recently conducted by the All Progressive Grand Alliance (APGA) on Friday, took an ugly dimension as rebel group emerged from the party, calling itself Authentic All Progressives Grand Alliance (AAPGA). Addressing newsmen in Abuja , the National Chairman of factional body (AAPGA), Chief Jerry Obasi â€‹â€‹â€‹â€‹â€‹and the National Secretary, Alh. 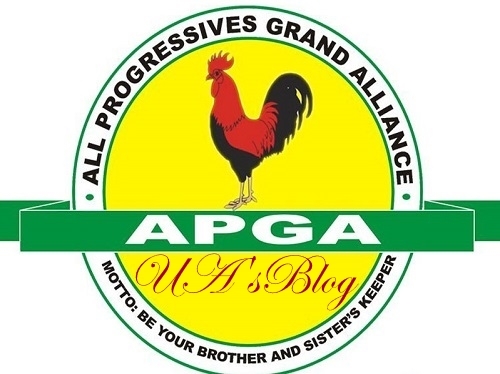 A.D. Musa, called on Governor Willie Obiano and National Chairman of All Progressive Grand Alliance (APGA), Dr. Victor Oye to resign from their offices with immediate effect. The body which recalled various issues that have bedevilled the All Progressives Grand Alliance (APGA), in recent times, especially after the party primary elections, noted that Dr. Oye has taken APGA beneath the point he met it. Obasi said, “You are no doubt aware of the various issues that have bedevilled the All Progressives Grand Alliance (APGA) in recent times, especially after the party primary elections.